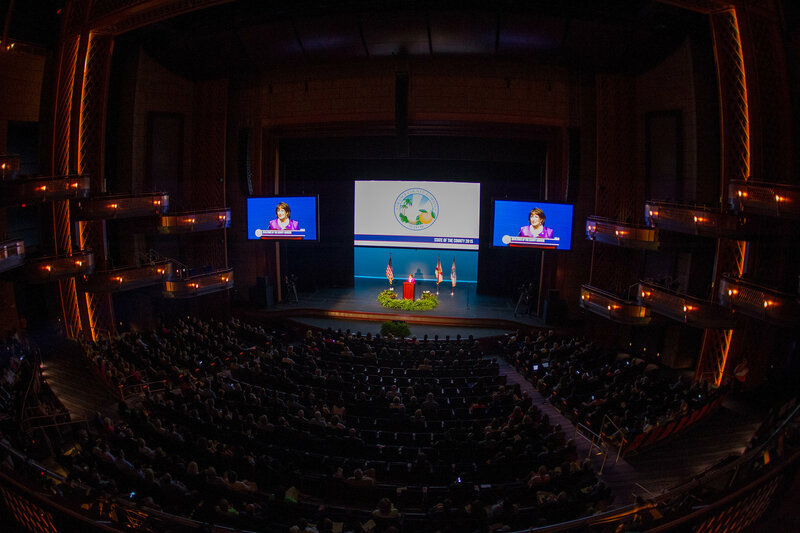 Orange County Mayor Teresa Jacobs delivered her 2015 State of the County address at the spectacular Dr. Phillips Center for the Performing Arts in the Walt Disney Theater on June 12, 2015. With more than 750 citizens in attendance, the largest State of the County audience in the history of Orange County, Mayor Jacobs provided dignitaries and citizens with a detailed report on the region’s strong and robust economy that saw rising property values, tremendous job growth, historic record-breaking visitation numbers, outstanding economic achievements and remarkable milestones for the region’s incredible sports and arts and cultural venues. Mayor Jacobs’ capstone announcement outlined a proposal for one of the largest capital investment projects in the history of Orange County, a $300 million initiative called INVEST in Our Home for Life. The funds will be spent on roads, parks, pedestrian safety projects, public and fire safety facilities and affordable family housing in Orange County. INVEST in Our Home for Life will be funded through existing resources thanks to conservative budgeting and an improving economy, not through increased taxes. This year’s address focused on the region’s significant achievements ranging from Orange County’s new multi-modal hub that will historically connect five modes of transit at the Orlando International Airport; new additions at the Dr. Phillips Center; the County’s low 4.7 percent unemployment rate – a staggering drop from the 11.3 percent in 2010; projections of nearly $427 million in countywide property tax revenues for the upcoming fiscal year; advances in transportation including the I-4 Ultimate project and SunRail; and transformational opportunities with the opening of the Orlando Veterans Administration Medical Center and the U.S. Tennis Association complex in Lake Nona. Orange County is now on the world stage for arts, sports, commerce, trade and family entertainment and publications, including Forbes and The New York Times, have taken notice of the region’s fiscal reliability and growing quality of life enhancements. In fact, the nation’s big three credit agencies – Fitch Ratings, Moody’s Investors Service and Standard & Poor’s Financial Services – just elevated Orange County’s credit ratings to historic levels, an extraordinary reflection of its resilient, prosperous and flourishing economy. This past year, the region also showcased its story of entrepreneurship, high-tech innovation, world renowned modeling, simulation and training cluster, favorable business environment, cutting-edge film and digital media training facilities and thriving Medical City through its new regional branding campaign Orlando. You don’t know the half of it. It’s no coincidence that so many have already taken notice of Orange County’s worldwide reputation. In May, the tourism economy further solidified the region’s position as the No. 1 global destination with Visit Orlando’s momentous announcement of 62 million guests visiting the region in 2014. In tandem with Orange County’s economic achievements and with the continued growth of its world famous International Drive and the booming Orange County Convention Center, the County is working to create a revitalized vision for the I-Drive District showcasing new dynamic spaces, including pedestrian plazas, dedicated transit lanes and sidewalk enhancements for local residents and guests to enjoy. With the $187 million capital improvement project at the Convention Center and by investing in roadways, infrastructure, transportation connectivity and pedestrian projects that enhance the quality of life for citizens and visitors, the region is securing a dynamic future for generations to come. Even as Orange County works on its next chapter as the tourism capital of the world, the County is focused on caring for its most vulnerable citizens in transformational ways. Through valued partnerships with the faith and social service organizations, Orange County is lifting longtime homeless individuals, families and veterans on a path of hope and stability. For decades, Orange County has been the leading provider of services for the homeless, budgeting more than $5 million every year. With the Commission on Regional Homelessness and the creation of Orange County’s Family Homelessness Committee, the region has pledged to end veteran homelessness in Central Florida. Orange County also recently launched Open Table bringing homeless families on the path of self-sufficiency. Orange County is also playing a critical role in other serious struggles. Through its Youth Mental Health Commission Implementation Team, the County is making sure that young people receive the care that addresses behavioral and mental health issues. Keenly aware of the undeniable connection between domestic violence and child abuse, the domestic violence commission was also renamed the Orange County Domestic Violence and Child Abuse Commission in early 2015. Mayor Jacobs’ commitment to public engagement was again demonstrated with the return of last year’s Social Media Ambassadors who worked to expand the online conversation with the digital community. Joining the Social Media Ambassadors for a special pre-party were digital influencers and community partners who kicked off the conversation before the 2015 State of the County address using the locally created photo booth experience, Gifn. Throughout the Mayor’s speech, these digital influencers promoted the live stream of the event and their favorite highlights. These combined efforts contributed to an outpouring of social media engagement which encouraged residents to become more involved with their local government. Central Florida Hotel and Lodging Association President and CEO Rich Maladecki provided the introduction and Sisaundra Lewis, a finalist on NBC’s “The Voice” last year, sang the National Anthem. Retired Army Sgt. Juan Velazquez led the Pledge of Allegiance and the colors were presented by Orange County Fire Rescue. First Baptist Church of Orlando Senior Pastor David Uth, Ph.D., delivered the invocation, and classically trained musicians Stephen and Vanessa Huber Weber delivered the preamble. A collection of photos from the 2015 State of the County Address are available on Flickr for use by the media.